All right, I'm rotary swing founder Chuck Quinton, this is certified instructor Chris Tyler and today we're gonna show you how to sequence all the major muscle, all the big muscles to generate maximum power in the golf swing with minimum effort and this is a really, really simple drill that's gonna help you sequence all of these things correctly. Let's take a look at it. Chris, with this impact bag, this is gonna help you learn all the right things in a down swing to do things naturally. Because the golf swing should be very natural. It's not some voodoo mystical thing with a bunch of crazy different secret tricks of the trade. It's not like that at all. It's actually very similar to how you do anything naturally like when it comes to throwing motions using your big muscles those types of things. But what I want to show you first and Chris is gonna demonstrate is what we see so often how things are done incorrectly in a golf swing and that's gonna help you understand how we don't want to do it first. Once we understand how not to do it we're gonna be able to show you exactly how to do it. Because I'll actually demonstrate it first, I'm gonna throw it to you this way, so they can see how it would lool for a right handed golfer. And so what we see all the time is a lot of times golfer just don't know how to sequence things, the golf cub is really light, the golf ball is really light and you can just kind of fling the club at it, doesn't really help, so we take something kind of heavy. My impact bag probably weighs five or 10 pounds here and when somebody takes this, they should instinctively try to use the big muscles to move it, because it's not gonna be able to move it very fast if I don't. But we still see people do it wrong all the time. I'm gonna show you what that looks like. So, to do it wrong, a lot of times what people will do is they'll kinda take their arms back, move them across their body and they kind of do this. Now clearly that didn't generate a lot of power there right? What I did is I tried to use my arms and shoulders which if that's how you're used to swinging the golf club, obviously not gonna generate a lot of power. But that's a really common thing that we see all the time is they just try to use their upper body, their shoulders kind of swinging from the rectangle and just kind of heave it with their arms. Not gonna generate a lot of power. Chris, I don't know if you can show me from a eft handed perspective, but show a couple of other things that you typically see. All right, so not a good back swing there, now you just kind of went back like this and just heaved it with his arms and again, not a lot of power. Another thing that it will really help you with is understanding how to take the club back. Because what we see a lot of times is this reverse pivot and the hips sliding out this way and so and we talk about that laser beam, the knee not going out that way and so when you take an impact bag that doesn't really make any sense, because I would never take an impact baga and throw it like this. That wouldn't really make any sense. When you start learning how to move correctly, like we cover in the five minutes to master rotation drill, when we start getting this thing to move with our big muscles in our body, then we can start to sequence the downswing correctly, like we cover hin ow the lower body works. Now I'm gonna put this together the right way. I'm gonna load up this way, not this way, it's not gonna make any sense. Now I'm gonna use my body to moves this, because it's heavy, I'm loading up on my right glute, again another video that's covered how to load the right glute in the back swing, and then I'm gonna use my big muscles to move my torso and arms. It's gonna start with my little weight shift to the left, I'm gonna use my hips to start it and then I'm gonna release everything as I come through. Let's see if I can get any more power. Let me try knock Chris to this wall. Now I'm gonna go back there and now you can see that I stayed in my golf posture, released it, kept my arms here, but the big thing is how I powered the down swing. I sequenced it with getting everything to rotate with my body first. I always describe the lower body movement in the down swing as kind of like a big dump truck. It's gotta get all the smaller parts moving first and do a lot of heavy lifting but it's not moving very fast. But it's critical to get everything moving in the right sequence. Because if I try and sequence it with all my fast muscles, it's kind of what we demonstrated earlier, my arms and shoulders, I burn those out too soon, I don't have any power left by the time I get to impact. So what I want to do is use all these big muscles to get everything started and then release everything at the bottom. And so again those are covered in lots of other videos on the website. The big one again, how to load the right glute in the back swing, once you feel that this again is not gonna feel right and if you take an impact bag this isn't gonna feel right to do this. From there how the lower body works is gonna show you that you've gotta lead everything with your lower body, but just using an impact bag or have a medicine ball here, we can do the same thing with the medicine ball. This is pretty heavy, this is a 10 pound medicine ball, but you don't need to swing it very hard, just load up, feel the stable lower body, then use your big muscles to get everything to go through first. Again what we don't want to do is this. If you see your upper body way ahead of your lower body and we see this all the time, there's clearly no power in there, so you want to really use your lower body to get everything started, get the dump truck moving first to get all of the little pieces being driven by the lower body and then you'll have tremendous amount of speed and power to release at the bottom at the last point when it matters, which is at impact. Work on these drills, get your lower body moving first with an impact bag. Something heavy that's just gonna get your big muscles firing and learn how to sequence the down swing properly once and for all. 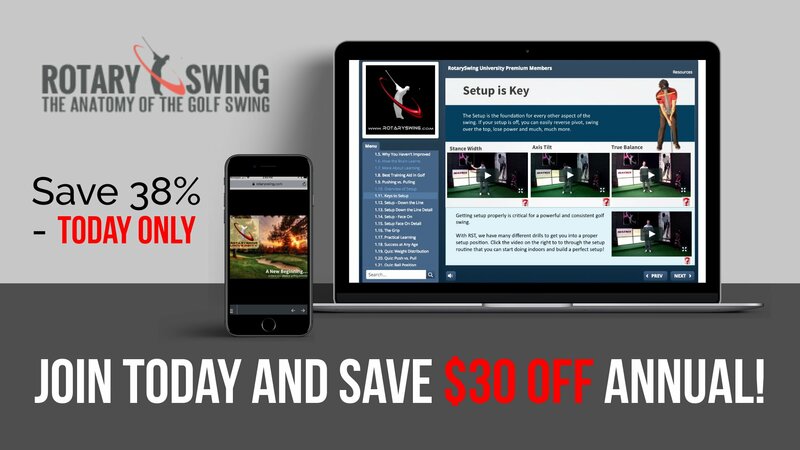 Get Your Free Membership to Finish Watching "Drill for Golf Downswing Sequencing" Right Now!